Prednisone, commonly sold under the brand name Deltasone, is pharmacologically classified as a steroid hormone (also known as corticosteroids). This class of drug is widely prescribed as an anti-inflammatory or immunosuppressant agent to minimize overt complications and discomfort resulting from aggressive inflammatory processes. The overall incidence of prednisone use among individuals for rheumatoid arthritis alone is as high as 8.9% per year. Prednisone exerts its action primarily by modulating the immunological responses of the body (or in simple words by suppression of the immune system). Under ideal situations, prednisone is obviously not recommended, yet in specific medical scenarios such as ulcerative colitis, skin lesions, allergic disorders, lupus, psoriasis, arthritis, and disorder of respiratory system, not only does it improve the quality of life but also acts as a life-saving treatment. Prednisone has a number of advantages and clinical indications, but is it also safe and risk free? Unfortunately, the possible benefits and uses of prednisone are highlighted by most pharmaceutical companies, yet people know very little about the side effects or complications of prednisone abuse or long-term use. Liron Caplan conducted a study to analyze the prevalence of prednisone use in rheumatoid arthritis patients and the results were alarming. It was identified that 35.5% of all the rheumatoid arthritis patients were reportedly using prednisone at the time of study; whereas the lifetime prevalence was even higher (65.5%). Caplan also identified that approximately 21- 25% patients continue to use prednisone regardless of their disease status. Acute respiratory failure. Long-term consumption with prednisone and other immunosuppressant drugs increase the risk of acute respiratory failure. Prednisone intake interferes with the maintenance of serum lipid concentration. long-term users may experience changes in the concentration of serum triglycerides and bad quality cholesterol. In individuals with pre-existing hyperlipidemic conditions, dose adjustment or modification is needed. As many as 12% develop hypertension with long-term prednisone therapy. The changes in blood pressure are attributed to fluid retention and electrolyte abnormalities reported in long-term prednisone users. Prednisone use is associated with significant changes in the metabolic activities of the body such as catabolism of proteins and alteration in the synthesis/production of proteins. This results in loss of muscles which also damages bone and joint function. In addition, this action of prednisone is responsible for impaired wound healing and a higher risk of developing infections. In some rare causes, extensive tissue damage as a result of pancreatitis, perforated peptic ulcer and gastrointestinal hemorrhage may also occur. Long-term consumption increases the risk of hyperglycemia (high blood sugar levels) and secondary diabetes mellitus due to glucose intolerance. Due to suppression of Hypothalamic-pituitary-adrenal axis (the classic biofeedback mechanism that controls the secretion of cortisol by the adrenal gland), Cushing's syndrome is reported in long-term users. Symptoms include developing a "moon face", appearance of fatty tissue referred to as a "buffalo hump" on the back of the neck due to redistribution of body fat, hirsutism or virilism, changes in the normal menstrual cycle, and impotency. Long-term intake of prednisone is associated with changes to normal vision such as glaucoma, cataracts, and changes in intraocular pressure. Data indicates that 10 mg of prednisone given over a long period of time (more than 1 year as prescribed after organ transplantation) increases the risk of developing a cataract (33% patients developed posterior subcaspular cataracts within a period of 26 weeks in a clinical trial). Low potassium levels, feeling of extreme thirst, increase in the frequency or urgency of urination, weakness in muscles. Allergic swelling involving throat, lips, face, or tongue is also reported in a number of individuals. Please be aware that the above mentioned are some of the most common side effects, but this is not a complete list. You should seek advice from your doctor regarding additional side effects. How Can You Minimize the Risk of Developing Side Effects or Complications? Do not consume alcohol or other drugs while you are on prednisone. Concurrent intake of cyclophosphamide and prednisone can lead to opportunistic infections (especially Pneumocystis carinii) leading to pneumonia and even death due to respiratory failure. Avoid contact with sick people (especially people who have severe illnesses or infections). Contact your primary healthcare provider immediately if you have an accidental contact with patients infected with active measles or chicken pox (the risk of contracting infection increases significantly in individuals on chronic prednisone therapy). If steroids are used for a longer time span, the risk of systemic complications increases significantly as evidenced by a number of clinical and research studies. The overall mortality rate in long-term prednisone users is as high as 5.7% as opposed 2.6% in previous prednisone users. In the table below, a brief comparison of long-term complications in current and previous prednisone users may help you in understanding how important it is to monitor prednisone intake. The risk of a variety of complications such as osteoporosis increases in individuals who are chronic smokers. In addition, individual who don't exercise are also at risk of developing overt complications (especially musculoskeletal complications) with long-term prednisone use. Likewise, those who have low calcium and vitamin D due to dietary or metabolic factors are also at a fairly higher risk of developing osteoporosis. Caplan, L., Wolfe, F., Russell, A. S., & Michaud, K. (2007). Corticosteroid use in rheumatoid arthritis: prevalence, predictors, correlates, and outcomes. The Journal of rheumatology, 34(4), 696-705. Horber, F. F., & Haymond, M. W. (1990). 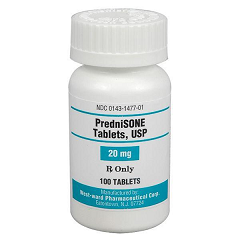 Human growth hormone prevents the protein catabolic side effects of prednisone in humans. Journal of Clinical Investigation, 86(1), 265.
van Everdingen, A. A., Jacobs, J. W., van Reesema, D. R. S., & Bijlsma, J. W. (2002). Low-dose prednisone therapy for patients with early active rheumatoid arthritis: clinical efficacy, disease-modifying properties, and side effects: a randomized, double-blind, placebo-controlled clinical trial. Annals of internal medicine, 136(1), 1-12. Bollet, A. J., Black, R., & Bunim, J. J. (1955). Major undesirable side-effects resulting from prednisolone and prednisone. Journal of the American Medical Association, 158(6), 459-463. Lozada, F., Silverman, S., & Migliorati, C. (1984). Adverse side effects associated with prednisone in the treatment of patients with oral inflammatory ulcerative diseases. The Journal of the American Dental Association, 109(2), 269-270. Sen, R. P., Walsh, T. E., Fisher, W., & Brock, N. (1991). Pulmonary complications of combination therapy with cyclophosphamide and prednisone. CHEST Journal, 99(1), 143-146.